Did you know that our Wylie, Texas HVAC services include belt inspection and replacement? It’s true. 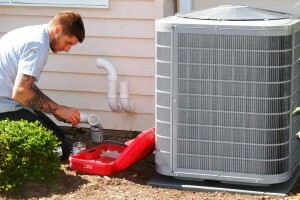 We include it on our summer and winter HVAC checklists but are able to take care of problems year round. The ones we encounter most of the time involve V-belts. It is not that V-belts are inherently bad. It’s just that they are the most popular ones on the market. So, we tend to run into them more often than say wrapped belts. Kiwi AC and Heating professionals prefer V-belts over others for several reasons. For example, the belts tend to be made from a superior compilation of materials that allow for just the right mix of rigidity and flexibility. As such, they tend to wear evenly, last longer and very rarely slip while in operation. Of course all of those factors equate to better running HVAC systems and cooler building interiors. Understandably, there is some maintenance involved when it comes to V-belts. Although they tend to resist vibration related shifting, it does happen. Consequently, they occasionally need to be re-positioned and tightened. Re-positioning and tightening V-belts generally doesn’t take long though. So, service calls associated with belt adjustments tend to go quickly. There are also times when V-belts start to show wear and tear. Depending on how rough the V-belts look and feel, our Wylie HVAC professionals may suggest replacing them with fresh ones. The new ones often go on easy but need some expert adjustment in order to fit particular HVAC systems perfectly. Once the replacement V-belts are in place, they should last at least an entire heating or cooling season. To learn more about V-belts and the important roles they play in HVAC systems, please contact Kiwi AC & Heating. We provide five-star service that includes preventative, V-belt maintenance, replacement and expert repair.